2019 Robinson Motorcycle Buys Harleys All Year Long! Are you looking to turn your Harley into cash? Are you tired of trying to sell your Harley-Davidson privately? Call Robinson Motorcycle at 1-877-805-4222 today. Simply send us a few pictures of your Harley, (one from each side ) and give us some information on accessories, options, mileage, condition and lien information and we will try very hard to fulfill your wish to sell. New Price $24,950 + Tax - This Sharp 2018 H-D LIMITED LOW has Incredible Savings compared to a new '19. ONLY $48 Week on this MINT LIMITED LOW. This 2018 Including the New Twin Cooled Milwaukee Eight 107ci Motor and 6 Speed for nice power and torque, ONLY $48 Weekly and the Low Seat Height on this Model helps for any rider, This H-D Limited Low is Ready to Ride. With ONLY 29,080 miles you are going to like this Fantastic Harley. This outstanding 2017 Road Glide Special boasts the factory Custom Laguna Orange Pearl Paint! It has Full Tru-dual Stage 1 Vance & Hines Monster Rounds with Black Screamin' Eagle hi-flow intake and Vance & Hines Fuel Pack Tuning for Lots of Power and Torque! Blacked out Front Forks, CVO Custom 2-piece Seat with Matching passenger back pad for cool solo looks, Black Engine Guards, Black Axle Covers, Black Levers and Mirrors, 4 Point Hardware with Black Premium Luggage Rack with LED tail and Brake Light, Black Passenger Backrest, Black tank Dash, H-D Premium Grips, LED Front Turn Signals, all Factory Standard Security and ABS Brakes. With ONLY 2,700 miles this Amazing 2017 Road Glide Special is an incredible Value. Its a deal so good and won't last long. This Rare Crushed Ice Pearl 2017 Street Glide Special has gorgeouos Metallic factory paint and $5,000 in Options and Customizing, including Black Vance and Hines Tru-Dual Exhaust, 13" Rise Black Handlebars, Black H-D Bar Mounted Mirrors, H-D Contoured custom Grips, Contoured Smoked Windshield, Smoked Day-maker head Light, Black Windshield Trim, Factory Security and 4 Point Quick Disconnect Hardware and Smoked Turn Signals. ONLY 1,400 miles.This Sharp 2017 Milwaukee 8 will save you $10,000 out the door from a comparable Customized new Street Glide. This Electra Glide Limited features all the stock equipment you've come to expect on the Ultra Limited including Luggage Rack, heated Grips, the big 107 cubic inch motor, ABS Braking as well as H-D Day Maker Headlight and Passing lamps for great night riding. It comes in Vivid Black, With 30,300 miles and INCLUDES our Robinson 2019 UNLIMITED MILEAGE Power Train Parts & Labour Warranty, OR, Upgrade your Harley Protection Coverage to a 1 - 3 YEAR PLAN with North American Wide Coverage - Unlimited Mileage - Parts & Labour - Valid at any licenced motorcycle dealer or mechanic - Only $995, or from $3 week. This Vivid Black Street Glide Special features over $9,000 in Options and Accessories including Stage 1 Exhaust, 13" Black Bars with mounted Black Mirrors, HD Grips, Factory Security, Chrome Lower Forks, Floating Rotors, Chrome Axle Covers, Chrome Custom Wheels, Screamin' Eagle Headlight, and 4 Point Quick Disconnect Hardware. Only 2,300 miles. Wow! Quick Detach Tour Pack - $4,000 in options and Customizing including: Deep Sounding Vance and Hines Hi-flow Exhaust, Quick release tour-pak, H-D Factory Custom Cosmic Blue Pearl paint, Quick detachable rider backrest for great back support. It has LED Tail/Brake lights added for Awesome Brake lighting, chrome H-D hi-way pegs, With ONLY 2,600 Miles this Amazing Harley is Ready for you to Ride! This Spectacular Road Glide Ultra --- Easy Financing and Canada Wide Shipping. The Tri-Glide in factory Custom Cosmic Blue stands out from the crowd. With $2,500 in Options and Accessories in cluding HD Day Maker Headlight and Passing Lamps, Luggage rack, Factory security and Offset Highway Pegs. Only 12,770 miles.Trades welcome and we ship across Canada. This Street Glide Special offer $3,000 in Options and Accessories including Rinehart Exhaust, Contoured Tinted Klockwerks Windshield, Boom Audio 4 Speaker System including Saddle Bag Speakers and 4 Point Quick disconnect hardware. Only 2,750 Miles! This Outstanding 2016 Road Glide Custom has $7,500 in Customizing and Options including: Full Stage 1 Vance and Hines Tru-Dual Exhaust, Screamin' Eagle hi-flow intake and EFI Tuning, With Cool and Comfortable Black Mini Apes this Road Glide Custom Looks and Feels Great. It has the H-D Optional Hard Candy Custom paint that really stands out and very few people have. This Awesome Road Glide Custom has a H-D Smoked and Contoured windshield, LED turn signals with smoked covers and a nice set of H-D Dunlop tires. With standard features like ABS Braking, Cruise and factory Security this FLTRX Road Glide Custom is Ready to Ride, 15,800 miles Come See it Today ---- Easy Financing and Canada Wide Shipping available at Great Rates! INCLUDES our Robinson 2019 UNLIMITED MILEAGE Power Train Parts & Labour Warranty, OR, Upgrade your Harley Protection Coverage to a 1 - 3 YEAR PLAN with North American Wide Coverage - Unlimited Mileage - Parts & Labour - Valid at any licenced motorcycle dealer or mechanic - Only $995, or from $3 week. This Sharp, Local Canadian and very Strong Running Road Glide ULTRA has $5,500 in Options including: Full Stage 1 Vance and Hines Tru-Duals, Screamin' Eagle hi-flow intake and EFI Tuning! With The Stunning Factory Cosmic Blue Pearl paint this Harley Looks Fantastic. It has the large 6.5'' infotainment system with Navigation, H-D heated hand grips for chilly days, Chrome H-D Hi-way pegs, LED front signals, Fully Adjustable rider backrest, Chrome inner primary covers, Chrome heat-shield covers and Chrome shifter linkage. With 32,500 Local KM and 2 Great Dunlop Touring tires this Harley Road Glide ULTRA is Ready to Ride! Test Rids available, Easy Financing and Canada Wide Shipping at great rates! INCLUDES our Robinson 2019 UNLIMITED MILEAGE Power Train Parts & Labour Warranty, OR, Upgrade your Harley Protection Coverage to a 1 - 3 YEAR PLAN with North American Wide Coverage - Unlimited Mileage - Parts & Labour - Valid at any licenced motorcycle dealer or mechanic - Only $995, or from $3 week. This Stunning 2016 H-D Freewheeler has ONLY 820 Low-low miles - $3,500 in Options - Full Robinson Warranty - Easy Financing and Canada Wide Shipping! With the Factory Black Quartz Pearl paint it looks amazing! it has Custom Black handle bars and Matching Engine bars, Black Love Jugs engine cooling system, Chrome Luggage rack and Quick Detachable passenger backrest for lots of passenger joy! With ONLY 800 miles this Harley is Ready for the Road. Come See it Today! This Unbelievable 2016 BX Custom Design Road Glide Ultra has Arrived - This Stunning Harley has been Totally Customized by BX Custom Design and Looks Fantastic! Its Featured on BX Custom Design`s web site. It has got a Low 12,400 miles and Over $20,000 in Customizing that Stands Out! Or find your own BX Custom Harley and let us Import and Finance it for you! --- Canada Wide Shipping and Easy Financing. INCLUDES a Robinson 2019 "Power Train" Unlimited Mileage Warranty. OR, Upgrade your Harley Protection Coverage to a 3 YEAR PLAN with North American Wide Coverage - Unlimited Mileage - Parts & Labour - Valid at any Licenced motorcycle dealer or mechanic - From Only $1,295 or from $3 week. This Vivid Black Street Glide Special features over $5,500 in Options and Accessories including Full Stage 1 with Vance & Hine Power X Exhaust,and Screaming Eagle Intake, Chrome Screamin' Eagle Passenger Floor Boards, Quick Disconnect 4 Point Hardware, ABS Braking and Willie G Gasdoor, Timing Cover and Derby Cover and Factory Security. Only 3,625 miles. From $ week + tax and licence, at a bike price of $ + tax & licence, at 6,99% with 10% down, up to 180 months, oac. All Open Terms for early pay-out. Choose Your Own Term and Down Payment, other terms available - Apply Today! New Price And Nicer than a Screamin Eagle - This Local 2015 Road Glide Special FLTRX 103 has $8,000 in Options and Customizing including Chrome Chrome Chrome and a great sounding Vance and Hines Exhaust. 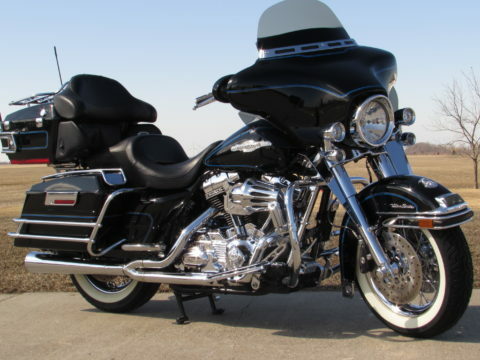 This Road Glide Special has a Low Seat height, is Cool & Super Clean! It features like the Powerful H-D 103ci Motor and 6 Speed for lots of cruising power and Torque! Other features like Factory ABS Braking, Security, Electronic Cruise Control, Complete Chrome Front end, Harley Custom wheels, and Chrome Brake Rotors. Up Top it Features comfortable Beefy Apes with Complete chrome Controls, Internal wiring and Braided Steel Lines and Cables! With a Local 13,200km, previously sold and serviced at Robinsons its a great value, plus it has a brand new Michelin Commander Rear Tire, and its ready to cross the country and ride ride on! -- Ask About our Canada Wide Shipping at great rates! 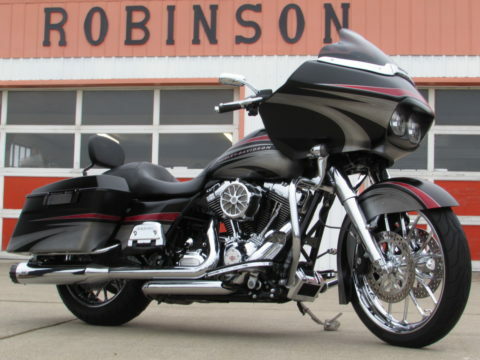 Don`t miss this Road Glide, it will sell Fast. Trades welcome and we ship across Canada. This Extraordinary 2015 Road Glide CVO has Over $9,000 in Amazing Options. Its got Full Internally wired Carlini Menace Ape Handle Bars that Look Awesome! H-D Stage 4 Motor Which turns the 110ci into a Big 117ci Motor. With Big bore cylinders, Performance Cam, Forged Pistons, Hi-flow Injectors and 58mm Throttle Body to let this Beast Ride Strong. With the Stage 4 Motor you Need a Throaty Vance and Hines Tru-Dual Exhaust with Hi-flow intake and Screamin' Eagle Super Tuner for the EFI Tuning! This Super Sharp Custom Road Glide CVO comes in Burgundy Blaze / Typhoon Maroon and is Ready to Ride. It has Full Upgraded H-D Saddle Bag lid Speakers Added and All Stage 2 Rider and Passenger upgraded Speakers for Loud and Clear Tunes! Also this CVO has the Quick Detachable Tour-Pack for easy Stripped down Road glide Custom Looks. With an Unnoticeable 53,300 miles and 2 Great Dunlop American Elite Touring Tires this Beautiful Harley is Ready for you to Ride! --- Easy Financing and Canada Wide Shipping! This Simply Stand-out 2015 Street Glide Special has Over $5,000 in Options and Customizing including: Deep and Throaty Stage 1 Rinehart Tru-Dual Exhaust, Screamin' Eagle Hi-Flow Intake and a Vance and Hines FP3 Fuel Pack for Lots of Smooth Power and Torque! With a Beautiful Full Chrome Front end, Chrome H-D Hand Grips and a Smoked / Contoured H-D Windshield that Looks Awesome! It has a Chrome Lay-down license Plate Bracket, Chrome 4 point docking hardware, Chrome tie-down loops, Chrome Hot Toppers all Over, and a Fully Adjustable Hydraulic Rider Backrest for back support on long rides. With ONLY 5,900 Local KM this Immaculate 2015 Street Glide Special is Ready to Ride, Serviced and Certified come See it Today. Strong 103ci With full Stage 1 Exhaust, and Big 6.5'' H-D Navigation System --- Easy Financing and Canada Wide Shipping. This Stand Out Street Glide has $7,000 in Customizing and ONLY 1,600 Low miles. It has H-D Factory Charcoal paint and features Custom H-D Agitator Wheels, Bigger 19'' Front and 18'' rear, floating Rotors, Black Front end, Full Stage 1 Tru-Dual Vance & Hines Power X Exhaust, EFI Tuning and Hi-Flow Intake for Lots of Power and Torque! Its got a cool Carbon Fiber Dash, Smoked and Contoured H-D Windshield, Black Axle Covers and Factory security for peace of mind. With ONLY 1,600 Low miles this Street Glide is Ready to Ride, Serviced and Certified --- Easy Financing, We Take Trades and Canada Wide Shipping. From $49 week + tax, at a bike price of $26,350 & licence, 6,99% with 10% down, up to 180 months, oac. All Open Terms for early pay-out. Choose Your Own Term and Down Payment, other terms available - Apply Today! Only $51 Week! --- Easy Financing and Canada Wide Shipping. New Price - This Super Sharp 2014 Ultra LIMITED has $6,000 in Options and Customizing Including: Full Stage 1 D&D Fat Cat Throaty Exhaust, Screamin' Eagle Hi-flow intake and EFI Tuning for Smooth Power and Torque! With a Full Chrome front end, Factory Custom Daytona Blue Pearl paint, Chrome dash trim, Upgraded Hog Tunes Speakers for loud and Clear Tunes! With 50,600 miles a like new rear Dunlop and Brand New tire front installed here this LIMITED is Ready to Ride. This Daytona Blue Pearl Limited is very Clean and has Super Cool factory custom Paint! --- Ask About our Canada Wide Shipping at Great Rates! This Limited features $2,500 in Options and Accessories including Rinehart Mufflers, HD Deck Plate Hi-way Pegs with Offsets, LED Head Light, Windshield Trim, Factory security, Painted to Match Inner fairing and Chrome Dash bezels plus it has Harley's Extended Service Plan good until April 12 2020. This Striking Tri-Glide boasts $8,500 in Options and Accessories including Stage 1 with Vance & Hines Power Cross Over Exhaust with Screamin' Eagle Mufflers and Billet Hi Flow Intake, Custom Chrome Wheels, and Chrome centered Rotors, LED Turn Signals, Live To Ride Gold Light Visors, HD Custom Grips, Chrome Windshield Trim, Chrome Dash Bezels and Speaker Grills, Air Wing Luggage rack with Third brake Light, Factory security and a folder full of service records. This Super Sharp 2013 Road King Classic has ONLY 18,400 Local KM and Loads of Options and Customizing including: Stage 1 Screamin' Eagle Exhaust, Full GPS with handle bar mount, Factory Pearl White Paint, Smoked Touring Windshield for great wind protection. With LED tail/Brake lights this Road King Classic is going to be Seen! With a low 18,400 Local KM this Harley is Ready to Ride --- Easy Financing and Canada Wide Shipping. INCLUDES a Robinson 2019 "Power Train" Warranty OR, Upgrade your Harley Protection Coverage to a 3 YEAR PLAN with North American Wide Coverage - Unlimited Mileage - Parts & Labour - Valid at any Licenced motorcycle dealer or mechanic - From Only $1,295 or from $3 week. NEW 3 Year North American Coverage Warranty included! You Won't Believe your Eyes! 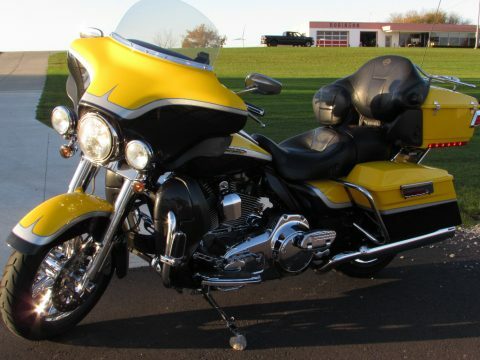 Stand Out from the Crowd with this Exceptional Screamin' Eagle CVO 110 Ultra, its in Immaculate condition, and has the stand out Crystal Citron & Diamond Dust with Big City Lights Graphics in outstanding condition! As part of the complete full service we do, we've also inspected the cam chain tensioners and they're in exceptional condition. A Must Ride to appreciate the full torque and smoothness of this CVO. Of course this Screamin' Eagle come from the Factory with Unlimited Chrome and Features including Electronic Locking Saddlebags, Heated Hand grips, CVO Hi-way Pegs, Factory Security, Rider Backrest, Passenger Backrest with Fully Adjustable Lumbar Support, Upgraded H-D Speakers and way too Much too List. And looking at the Immaculate Condition would would never imagine that it has 145,000 miles on it. With 2 great Dunlop Harley Tires and a 3 Year North American 100 % Powertrain Warranty, its a fantastic value. We take trades too. New Price - This Sharp 2012 Electra Glide ULTRA Looks and Rides Fantastic! It has been Locally Owned and Traded, Stage 1 Hi-flow Exhaust for a nice throaty rumble. This ULTRA has the Factory 2-tone Big Blue Pearl and Vivid Black which is amazing. With a Great rear tire and good front this Harley is Ready for some Riding! With 77,800 KM this ULTRA is reayd for you to ride! --- Easy Financing and Canada Wide Shipping. 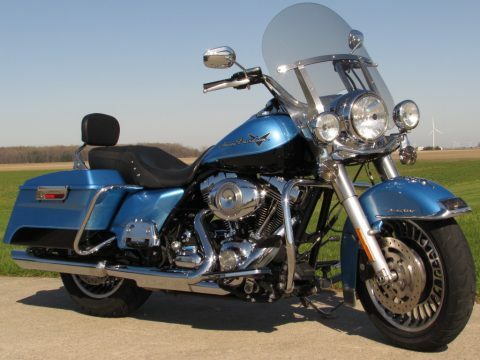 New Special Price - This 2011 Road King in Cool Blue Pearl and Vivid Black looks Great, It has Hi-flow exhaust and a Hi-flow intake with EFI Tuning for a nice rumble and a bit extra Power! This Sharp 2-tone Road King rides smooth and powerful its just waiting for a rider. With a factory quick detachable windshield its easy for go for long relaxing rides with less wind or take it off for riding around town! With the Big 96ci Motor and 6 Speed transmission you can tour for days with lots of comfort. The original factory 2 up seat provides plenty of rider and passenger comfort and the overall Road King feel is just a fantastic smooth riding classic Motorcycle! The quick detachable passenger backrest shown in some photos is optional and additional at $350 if desired. With a very Tight Sounding Motor and Fully Serviced here at Robinson's! 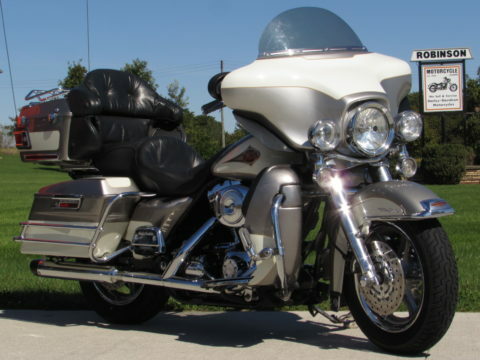 With a clean 61,000 miles this Road king is available for test rides anytime. 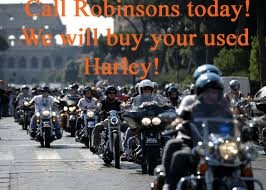 Call Robinson`s today before its gone! ---- Ask About our Canada Wide Shipping at great Rates! One of Only 346 CVO Road Glides produced in Frosted Ivory and Vintage Gold in the World! - ONLY 14 originally released in Canada. This Spectacular CVO Screamin' Eagle Road Glide ULTRA is a MINT and Simply Beautiful Touring Machine! It has $5,000 in Customizing and Options. The Most stunning feature of this CVO Road Glide is the Outstanding Frosted ivory & Vintage Gold with Quartzite Graphics which is not seen very often! These Road Glides are the Best of the Best for Touring the Country or the Continent! This CVO comes with the Screamin' Eagle 110ci Motor and 6 Speed transmission but for a bit extra this Road glide is equipped with a Tru-Dual Hi-flow Exhaust for a Nice tone and Rumble! The Sound System is a Beautiful Music Maker - upgraded with J&M Fairing Speakers and also J&M passenger speakers combined to the added Lower fairing J&M Speakers and the DSP Rokker Amp for Amazing Sound Volume and Quality! It has a Chrome Spyke Super-torque Starter for easier Starting which is a very nice option. This Sharp Road Glide has a Full Chrome inner Primary, Full LED Tail/Brake light and Very bright LED Rear Turn Signals, Combined they make you really be Seen! It has Chrome Hot Toppers Everywhere and all the Chrome Factory Features make this a Wonderfully Unique CVO Road Glide! With 37,900 Unnoticeable Miles and 2 Great H-D Dunlop Touring Tires this CVO Screamin' Eagle Road Glide wont last Long! This Strong and Smooth 2011 Ultra LIMITED has some nice Options and Customizing including; Throaty hi-flow Exhaust, Integrated Brake/Tail lights for better brighter Brake lights, Blacked out rear tour-pack lighting covers, Upgraded Rider and Passenger J&M Speakers for loud and clear music all day long. It has a Brand New Rear tire installed here and an Amazing front tire, with 77,700 miles this Ultra LIMITED is Looking good and ready for a rider. Low $37 Week --- Easy Financing and Canada Wide Shipping. INCLUDES a Robinson 2019 "Power Train" Warranty. OR, Upgrade your Harley Protection Coverage to a 3 YEAR PLAN with North American Wide Coverage - Unlimited Mileage - Parts & Labour - Valid at any Licenced motorcycle dealer or mechanic - From Only $1,295 or from $3 week. 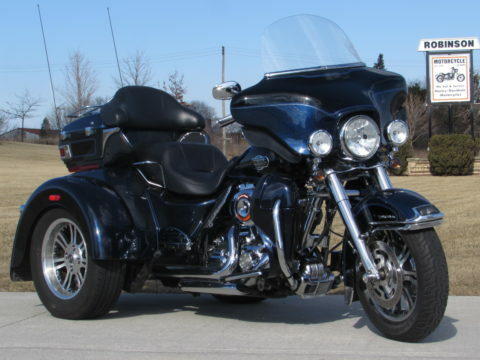 This From New Ontario 2011 Electra Glide Police Edition 103 has been Locally Owned and just traded in by a gentlemen. With Nice Options including: Jensen Radio with Full Speakers for great quality tunes and full LED Head-spot Lights for Amazing night riding. With 58,900 Local KM this Sharp 2011 Electra Glide 103 is Serviced and Certified, Ready to Ride --- Easy Financing and Canada Wide Shipping. Now From ONLY $36 Week! 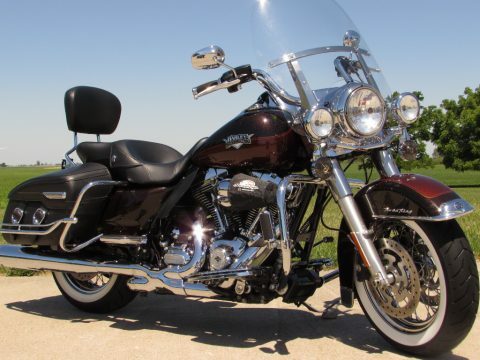 This Immaculate and Locally owned 2011 Road King Classic 103 has been Sold here and serviced here! It has $4,500 in Options and Customizing including: The Full Stage 1 Vance and Hines Tru-Dual Power x cross overs with big 4'' Vance and Hines Exhaust and EFI Tuning! This Road King Classic has Factory 2-tone Root beer Pearl that just shines amazing in the sun light. It has the Factory 103 and 6 Speed for loads power and torque when ever you need it, it has the quick detachable touring windshield, Factory standard ABS Braking, Security and Electronic Cruise Control. With a upgraded H-D Speedo/tach for easy RPM reading, Chrome Skull rider and passenger floor boards with passenger chrome covers, matching skull hi-way pegs, chrome saddle bag rails and H-D hand grips for nice comfort. The passenger backrest shown in some photos is optional and additional at $395 if desired. With Only 43,600 local Kilometers and a great set of dunlop tires this Road King 103 is ready to ride home! --- Ask About our Canada Wide Shipping at Great Rates! INCLUDES our Robinson 2019 Power Train Unlimited Mileage Warranty. OR, Upgrade your Harley Protection Coverage to a 1 - 3 YEAR PLAN with North American Wide Coverage - Unlimited Mileage - Parts & Labour - Valid at any Licenced motorcycle dealer or mechanic - from Only $995 or from $3 week. This H-D Flame Blue Pearl Road King features over $4,500 in Options including Stage 1 with Cobra Pipes and Air Scoop Intake, 13" Handlebars with Braided cables, Bar & Shiels Floor Boards pedals and Shifter Pegs, Chrome Passenger Board Covers, Smoked lenses, Windshield, Chrome Inner Primary Cover, and Chrome Billet Shift Linkage. 12,400 miles. New Price! This Super Cool & Super Clean 2010 Ultra LIMITED 103 has some nice features like the Powerful H-D 103ci Motor and 6 Speed for lots of cruising power and Torque! Other features like Factory ABS Braking, Security, Electronic Cruise Control, 2-tone H-D Black Ice paint this Ultra LIMITED looks great! With 95,700 miles and a set of Dunlop touring tires This LIMITED is ready to ride! --- Ask About our Canada Wide Shipping at great rates! Don`t miss this Limited it will sell Fast. It comes with our Robinson 2019 Drive Train Warranty OR, purchase our Low Cost Harley Protection Coverage 3 YEAR PLAN with North American Wide Coverage - Unlimited Mileage - Parts & Labour - Valid at any Licenced motorcycle dealer or mechanic - From Only $1,295 or from $3 week. New Price - This 2010 Limited in Two-Tone Scarlet Red & Vivid Black has over $4,000 in Options and Accessories including Full Stage 1 with Rinehart Exhaust and Hi-Flow intake, Chrome Front Forks and Axle Covers, Chrome Controls and Levers, HD Bar and Shield Rider and Passenger Floor boards with Chrome Covers, Brake Pedal and Shifter Pegs, Chrome Dash Bezels, Speaker Bezels, Head Light, Passing Lamps and Turn Signal Deep Visors, fairing Mounted Turn Signal Inserts and Chrome Windshield Trim. It has 33,600 miles and INCLUDES our Robinson 2019 "Power Train" Warranty. You can also upgrade your Harley Protection Coverage to a 3 YEAR PLAN with North American Wide Coverage - Unlimited Mileage - Parts & Labour - Valid at any Licenced motorcycle dealer or mechanic - From Only $1,295 or from $3 week. 2009 Harley-Davidson Electra Glide Classic FLHTC Dressed Up and Ready to Tour! This great looking locally owned Canadian Electra Glide Classic features over $4,500 in Options and Accessories including Stage 1 with Samson Exhaust, Hi-Flo Intake, Custom Ghost Flames over Vivid Black Paint, Painted Inner Fairing, Chrome Handlebar controls,and Levers, Fairing Tweeter Speaker Kit, Chrome Dash Bezels and Speaker Grills, Painted to Match Hard Lower fairings, Chrome Inner Primary Cover and Engine Covers, HD Shifter Pegs, and Quick Disconnect Tour Pak. Only 47,850 Kilometers and it INCLUDES a Robinson 2019 "Power Train" Warranty. This Local and MINT, One of a Kind Peace Officer Special Edition Ultra Classic has over $15,000 in Options and Customizing including: Vance & Hines 2 into 1 Exhaust, Screamin' Eagle hi-flow intake and EFI Tuning, Smooth Motor work like Screamin' Eagle heads, Camshafts and More! Heavy Duty Chrome Oil Cooler, Pull Back Chrome handle bars, Chrome hand Controls, Chrome Braided Lines, Chrome Profile H-D Wheels, Wide White Wall Tires, and Loaded with every imaginable Piece of Engine Chrome! Its got Chrome Inner Primary cover, Full Chrome Front End, Controls, Levers, Dash Bezels, Speaker Grills, Upgraded Bullet spot lights and LED Turn Signals, Chrome Floating Rotors, Axle Covers, Chrome Frame Covers, Painted to Match Inner Fairing, Street Glide Mirrors, Bar and Shield Rider and Passenger Floor Boards, Shifter Pegs and Brake Pedal, Saddle Bag Lid Rails and a H-D Quick Disconnect Tour Pack with Luggage Rack LED Brake/tail Light and Chrome Rails, Hot Toppers throughout the bike, Smoked Fender Tip Lights and LED Turn Signals, LED Tail Light, HID Headlights and Passing Lamps, Chrome Center Stand and Beautiful Factory paint with Metal flake Clear Coat. We here at Robinson's replaced the Clutch Assembly 2,500 miles ago. With a local 60,900 miles this Stunning Harley can be yours! --- Canada Wide Shipping at Great Rates. An Absolutely Stunning 2008 CVO Ultra can be yours for ONLY $39 Week - With a Local 38,300 miles and a upgraded Stage 1 Vance and Hines Throaty Exhaust this Cvo Looks and Rides like a Dream and sounds like a Harley Should. With The Factory Features including Warm heated hand Grips, Heated Seat and Chrome wheels hand grips and Everything else! With Amazing CVO Factory paint this Screamin' Eagle is Outstanding, Only 38,300 miles this Harley is MINT. Ask About our Canada Wide Shipping at Great Rates! Purchased from Robinson's in 2008, and Mint Condition Its just like out of the crate! A Local gentleman that on put on With ONLY 17,500 miles... that's only 1,500 miles per year average. This 2007 is Quite Prefect all the way around, new oils, smooth comfortable and it sits lower than the higher frame touring bikes. It has the Strong and Super Dependable 96 and 6 Speed Transmission. Hi-flow Throaty Exhaust, Chrome H-D Hi-way pegs, Chrome saddle bags lid rails and More! We take trades, payments, A must See in Person Harley! --- Easy Financing and Canada Wide Shipping. This Strong and Throaty Sounding 2006 Electra Glide ULTRA has Over $4,500 in Options and Customizing including: Full Stage 1 Tru-Dual Exhaust, it had the Cam Chain Tensioners replaced by the original owner and have about 60% lifer remaining for worry free riding. It has Cool Factory 2-tone Black Cherry / Black Pearl paint that looks Awesome! It has Stage 1 Tru-Dual Rinehart Exhaust for a Deep and Throaty Rumble, Screamin' Eagle hi-flow Intake and EFI Tuning! Factory Security, Electronic Cruise Control, Trailer Hitch and Removable Rider Backrest some of the nice options. Its got Chrome passenger floor board covers, Chrome saddle bag lid rails and a Chrome Luggage rack. With 104,800 Local KM this Harley has a Like New Rear Dunlop Touring tire and Great Front tire. Come See it today, Test Rides Available --- Easy Financing and Canada Wide Shipping. This 2004 Ultra Classic has $14,000 in Performance Motor Work and Customizing including: New Hydraulic Cam Tensioners, Cam Plate and High Flow Oil Pump installed by Robinson Motorcycle to match the Big Bore with Cams, CNC Ported and Polished heads and Manual Compression releases which make this ULTRA Run Strong! Combined to Full Tru-Dual Thunder-header Exhaust, Screamin' Eagle Intake and EFI Tuning for Maximum Torque and Horse Power and a Deep Rumble that is sure is impress! With other Customizing like the Custom Flame Chrome Wheels, Chrome matching Rotors, Full Chrome front end, Full Chrome inner Primary, painted inner fairing, H-D Chrome Rider and passenger flame floor boards with passenger chrome covers, Flame saddle bags latches and Full Chrome hand controls! With Factory Security and Electronic Cruise Control for easy relaxing riding, 71,700 Miles and 2 Good H-D Dunlop touring tires, this ULTRA comes fully Certified and Serviced for worry free riding and INCLUDES our Robinson 2019 Power Train Unlimited Mileage Warranty. This Road King Classic features $4,000 in Options and Accessories including Hi-Flow Intake, Factory Security, Braided Cables and Chrome Controls, Upgraded Mirrors, Rider backrest, Chrome Passenger Board Covers, Flame Grips, Floor Boards, Brake Pedal Shifter Pegs and Hi-way pegs, Nostalgia Rails, 6 Point Quick Disconnect hardware and Wide White Wall Tires., White. 33,800 miles. This 100th Anniversary Electra Glide Classic has $3,000 in Options and Accessories including Stage 1 with Python Exhaust Factory security, Street Glide Seat, Quick Disconnect Tour Pak with Luggage Rack, Chrome Passenger Board Covers, Chrome Dash Bezels and Speaker Grills, Extra Engine Chrome, Smoked Lenses, Kuryakyn Grips, and a Smoked Shorty Windshield with Chrome Trim. 102,700 kms and INCLUDES a Robinson 2019 "Power Train" Warranty. This Super Strong Running Electra Glide Ultra Classic in Silver/White has some Amazing Options and Performance Upgrades including Cams, Screamin' Eagle Ported and Polished Heads and of course Big Bore. Its got a removable Rider's Backrest for nice comfort and cool Street Glide Mirrors. With 65,100 miles and INCLUDES a Robinson 2019 "Power Train" Warranty. 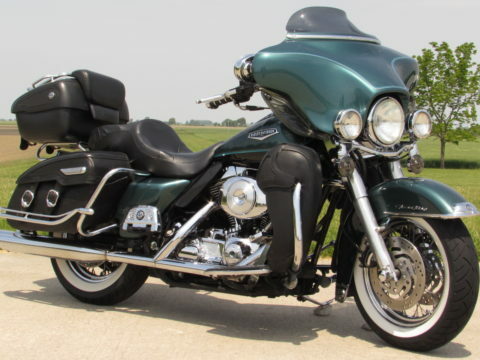 This Outstanding 2002 Road King Classic has well over $11,000 in Options and Customizing and a Low 20,050 MINT miles. Purchased here at Robinson's 4 years ago and locally owned it has Amazing Options including: Stage 1 Screamin' Eagle Heads, Full Chrome front end, Chrome H- D Wheels, Chrome H-D Hand controls, chrome levers and Chrome H-D Mirrors. This Stunning Road King has a the easy starting optional factory fuel injection. its got the Quick Detachable bat-wing Fairing for amazing looks and wind protection! It has Harley LED Day maker headlight and spot lights for great night riding, Chrome Engine bolts all over, Upgraded Chrome saddle bags rails, Chrome Rider and passenger floor boards with foot controls that look Great! Its Fantastic Eye catching paint looks Great, 4 point docking hardware included and the quick release backrest is optional and additional at $395 if desired. With Only 20,050 Local miles and 2 Like new Dunlop tires this Harley is Looking like new and is sure to Impress everyone! INCLUDES a Robinson 2019 "Power Train" Warranty. 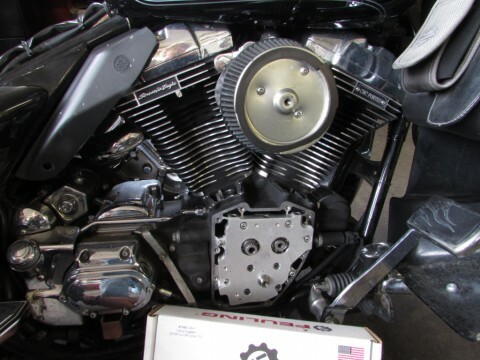 This Locally Owned and Traded beautiful Vivid Black Road King was rebuilt 20,000 kilometers ago and features cams and Full Stage 2. It also features over $7,000 in Options and Accessories including Rinehart Tru-Dual Exhaust, Screamin' Eagle Intake, Chrome Front End with Axle Covers, Chrome Controls, Chrome levers, Skeleton Hand Mirrors, Rear framer heat Deflectors, LePera Seat, Handlebar Bracket Mounted Tachometer, New Speedo, Headlight Modulator, HD Flame Grips and matching Floor Boards for both Rider and Passenger with Chrome Covers, Kuryakyn Highway Pegs, Lay down Licence Plate, Bullet Style Turn Signals, LED Smoked Tail Light, Street Glide Extended Rear fender. The Optional Passenger Backrest shown in some photos is available for $350. This CVO Road Glide in Vivid Black/Charcoal Graphics has everything you'd expect from Harley's CVO Line plus it has Matching Hi-Way Pegs, Adjustable Rider Back Rest and 10 CD Changer in the Quick Detachable Low Profile Tour Pak. With 56,700 miles. and INCLUDES a Robinson 2019 "Power Train" Warranty. This Sinister Blue Ultra Features $6,500 Iin Cool Options and Accessories including the Razor 21 inch Front Wheel, Tire Hugging Wrap Around Front Fender, Full St6age 1 with Slash Cut Vance & Hines Exhaust and Hi-Flow Intake, Chrome Handle Bar Controls, Buttons and Levers, Hi-Way Pegs, Luggage Rack, HD Flame Rider and Passenger Boards with Matching Shift Levers and Brake Pedal, Chrome Passenger Board Covers, Chrome Dash bezels and Speaker Bezels, 39,500 miles. This Sharp 2001 ULTRA Classic has Thousands and Thousands in Options and Customizing including: Full Stage 1 Tru-Dual Rineahrt Exhaust, Screamin' Eagle Hi-flow intake! It has Screamin' Eagle head work and Manual Decompression Releases. Its got LED Day-maker Head/Spot lights, 2 Tone Factory paint, Shorty Smoked windshield, Chrome windshield trim, partial chrome hand controls and ISO hand grips that a super comfortable! With 127,000 KM this ULTRA Classic is Ready to Ride --- Canada Wide Shipping available --- Come See it Today and even Test Ride it. 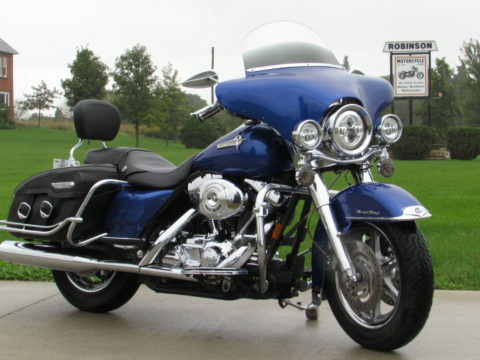 This Electra Glide Classic features $2,000 in Options and Accessories including Slash Cut Stage 1 Mufflers, Hard Lower Fairings, Grips, Luggage Rack and Shorty Tinted Windshield. With a Local 119,300 kilometers this Classic is one nice Harley. Come See it today, Tests Rides available weather permitting. ---- Easy Financing and Canada Wide Shipping. This Super Sharp 2000 Road king Classic has $6,000 in Options and Customizing Including: Stage 1 Vance and Hines Exhaust, Screamin' Eagle hi-flow intake and EFI Tuning! It has A Full Fairing with Jensen radio and Polk Audio Speakers, Quick Detachable Leather Tour-pack and Lowers for added wind protection! 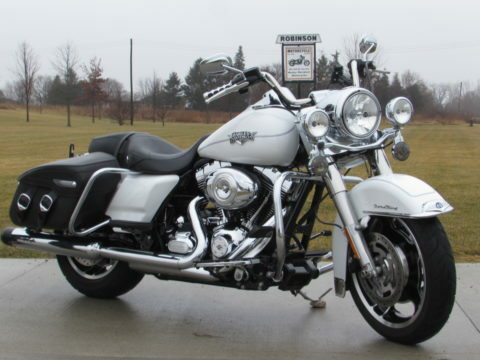 This Road King Classic has 2 Like Brand New Wide White Wall Metzeler Marathon Ultra Tires! The Handle bars have been changed to the California Beach Style handle bars with internal wiring and Chrome levers and grips, Lots of Engine Chrome, Smoked and Contoured Windshield, Chrome Street Glide style Mirrors and Chrome Floor board covers! It has very nice 2-tone Factory Paint that really looks great! With 49,900 miles this Road King has 2 Like Brand New Tires! - Canada Wide Shipping available at Great Rates! 95th Anniversary in the 2 Tone Rootbeer/Creme Road king Classic features over $4,500 in Options and Accessories including Stage 1 with Rush Exhaust, Hi-Flow intake and Re-jetting, HD Rail Rider Floor Boards, Passenger Floor Boards with Chrome Covers,, Brake pedal, Shifter Pegs and Hi-Way Pegs, Chrome Controls, Levers and Front Forks, Wide White Wall Tires, Braided Cables and Billet Shifter Rod. 38440 miles. This Tour Glide Ultra with Fuel Injection has over $4,000 in Options and Accessories including Stage 1 Exhaust, Harley Bar & Shield Rider Floor Boards and Passenger Floor Boards with Chrome Covers, Matching Brake Pedal and Shifter Pegs, and Grips, Tour Pak Luggage Rack with Spoiler and High Brake Light, Saddle Bag Glo Lights, and Lid Rails, Corbin Contrast Colour Stitched Seat, Chrome Primary Cover, Wide White Wall Tires and Chrome Covered Caliper, Rotors and Fork Covers. 66,000 miles and INCLUDES a Robinson 2019 "Power Train" Warranty. Rare Collector EVO - 25 Year Classic - MINT Original Electra Glide Sport With ONLY 11,900 Low Miles - Very Clean Factory Original paint, with Hi-way Peg, hand Grips, Super-Trapp Fish Tail Exhaust! Extremely Tight and Quiet Evolution Motor, With only 11,900 miles this EVO is in Stunning Condition! --- Come See it today --- Ask About our Canada Wide Shipping at Great Rates! INCLUDES our Robinson 2019 Power Train Unlimited-Mileage Warranty.